JERUSALEM—The near-term fall of the regime of President Bashar al-Assad in Syria was forecast Wednesday by Ehud Ya’ari, the highly respected Arab affairs analyst for Israel’s Channel Two. "It can happen very suddenly," he said on his channel’s main news program. "Unless Iran does what it hasn’t done so far—send in their own forces in significant numbers—Assad is finished," said Ya’ari, who closely monitors events in the Arab world and is normally cautious in his projections. "Assad no longer has enough troops to move around." Iran has been the prime support for Assad’s embattled regime during the civil war that has been raging for the past four years. It mobilized thousands of Shiite volunteers from Afghanistan and elsewhere and transported them to Syria but Ya’ari said they have proven to be poor fighters. Iran itself has a formidable army but it has thus far limited its military presence on the ground to combat officers and advisers. Although the fall of the Assad regime has been periodically predicted in the past, signs of collapse have recently accelerated as the pressure from rebel groups, and particularly from the Islamic State, have mounted. As recently as two months ago, the Syrian army together with its Hezbollah militia allies from Lebanon, foreign Shiite volunteers, and Iranian commanders launched a major attack in southern Syria aimed at clearing rebel forces from the border areas near Jordan and the Israeli-held Golan Heights. Rebel forces, acting with apparent coordination not evidenced in the past, took advantage of the Syrian concentration to launch simultaneous attacks elsewhere in the country, including the suburbs of Damascus. Thrown off balance, Assad and his Iranian advisers were forced to call off the southern offensive and scramble to meet the new challenges. Numerous small Islamic groups, which had acted independently, have now formed coalitions led by the second-largest rebel group—Jabhat al-Nusra. Although it is the Syrian franchise of al-Qaeda, the group has avoided for the most part the acts of brutality associated with the Islamic State, which now controls much of Syria. The Islamic State and al-Nusra have sometimes clashed in the past but the substantive nature of their relationship is not clear. The process of cooperation has been encouraged by Muslim Sunni states that finance the rebels and are interested in the fall of Assad and the consequent pushback of Shiite Iran. They see Tehran as attempting to acquire hegemony in the Middle East through its nuclear program and its cultivation of proxies such as Hezbollah. According to the Tel-Aviv-based Institute for National Security Studies, Saudi Arabia has reached understandings with Turkey, Jordan, and Qatar to train rebel forces on Jordanian and Turkish territory in order to overthrow Assad and consequently block the Iranians. "They would do this first," leaving the challenge of the Islamic State for later, said an institute report. 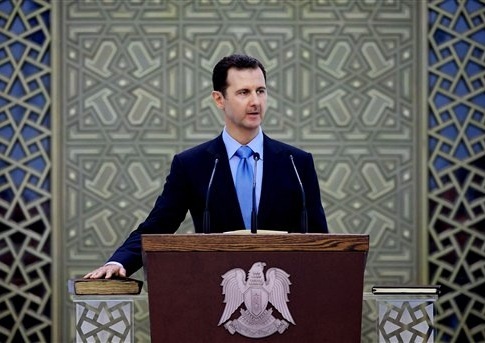 The report, written by Orit Perlov and Udi Dekel, said the object of the Sunni states is to encourage the formation of a single army under a united leadership "acceptable to most of the groups fighting against the Assad regime." This would presumably include the secular Free Syrian Army, which has Western support. The Sunni states see Jabhat al-Nusra, which has a specifically Syrian identity, as being the unifying force. In order to increase the chances of the United States backing the idea, the authors write, the states would attempt "to whitewash (Jaabhat al-Nusra’s) al Qaeda’s footprints." Mevlut Cavusoglu, the Turkish foreign minister, revealed last week that Turkey and the United States have agreed "in principle" to provide air support for rebels in Syria. He said the two countries planned to train 15,000 rebels at a military base inTurkey. However, the minister said there was disagreement between Ankara and Washington over who was to be targeted by the rebels being trained. The Turks insist that they be used primarily against the Assad regime, while the United States wants priority to go to fighting the Islamic State. "The rebel forces can be equipped and supported enough to fight at more than one front," a Turkish diplomat said. This entry was posted in National Security and tagged Bashar al-Assad, Free Syrian Army, Islamic State, Syria, Turkey. Bookmark the permalink.